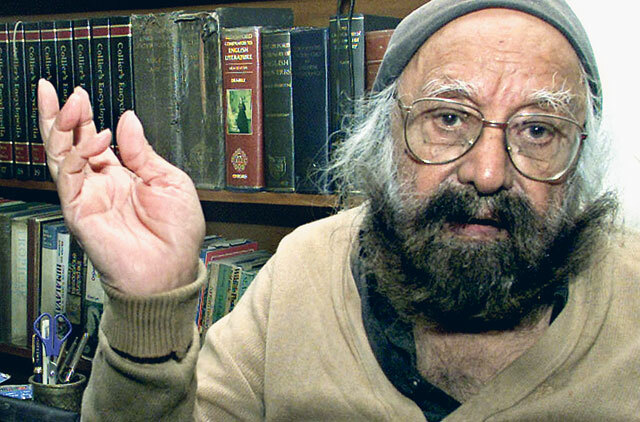 New Delhi: Located in New Delhi's Sujan Singh Park, it is the house of writer, editor and historian, Khushwant Singh. However, except for a small board which bears a terse message — ‘Please do not ring the bell if you are not expected' — there is no other name to identify the building with. Locals say that nothing has changed here over the years — neither the signboard nor the man who resides in the house it represents. Known to lead a disciplined life, 96-year-old Singh never sees anyone without a prior appointment and respects only people who value his time. His modest home is packed with books and historical objects. His living-room, where he spends most of his day reading and writing, is full of shelves displaying reference books, autobiographies and tomes on nature and history. Referred to as the ‘Grand Old Man of Indian journalism', Singh is well-versed in Urdu and Punjabi literature and has become as much of a celebrity as the people he writes about. At the height of terrorism in Punjab, he fearlessly denounced the cult of violence in the name of religion. As a result he was wanted by those he had condemned. He speaks to Gulf News, in an exclusive interview. You've been a prolific writer for many years. Are you working on a book at the moment? And if so what is it about? My last novel is coming out in December. It's called The Sunset Club. It's a mix of facts and fiction. It's about three men, all in their late 80s and I'm one of the men. The other two are friends of mine who have died. Why are you referring to it as your last novel? At my age, what else can I call it? I had no intention of writing it. A female friend gave me the idea, because I often talk about the two friends. She suggested I put my thoughts down on paper. Once the idea got into my head, it became a curse and I had to do it. So I got working on it. Now I'm just correcting the last few pages, but I had sworn not to write any more. It took me about a year to finish it. The plan was to release it in March, but because of my bad health, it will now be brought out by December. I'm unfit to move around. I don't meet people or attend functions, even those given in my honour. What's more, I need a lot of rest throughout the day because my sleep is usually disturbed. My hands have begun to shake and I cannot write. I have a typist who assists me. Now I can't read my own handwriting and sometimes neither can my typist, though earlier he used to be able to decipher whatever I wrote. But I still make it a point to answer my mail and write postcards like I used to. What made you refer to yourself as ‘not a nice man to know', a phrase that has become synonymous with your name? I said it because I write the truth and the truth is often hurtful. For example, friends of mine who have risen to high positions have died, but they don't automatically become saints by dying. So I write obituaries exposing the truth about them. Death doesn't make a goonda (thug) a saint. It's dishonest to praise a person because he has died. The ones who are still living have often taken me to the court. The cases were referred to the Press Council, but no judgment was ever passed against me. You once called Sanjay Gandhi, former prime minister Indira Gandhi's son a goonda? I called him a lovable goonda, which is a different matter. Who do you think is a modern day goonda? His son Varun with the kind of speech he made [during the last Lok Sabha elections]. You had once said, ‘We've had so many donkeys as prime ministers'. Who were you referring to then? Do you ever mince your words? I'm not impressed by the vast coverage given to the former prime minister Rajiv Gandhi in newspapers. In my recent column I've written all about his failures including the Sikh massacre in 1984, the cleaning of River Ganga, the way the Shah Bano case was upset and the fact that he allowed idols to be placed in the Babri Masjid. All these acts had a very negative effect. He could never make up his mind and was always asking people for advice. Being on the hit list of Punjab militants, you were given security for 15 years. Is the threat still hanging over you? Who would kill me now? They know I'll be going soon anyway. There have been reports about terrorism raising its head again in Punjab. Do you foresee militancy in the state again? I don't think so. Some people like making mischief. And all this sale of t-shirts emblazoned with huge photos of Jarnail Singh Bhindrawale, is being supported by Sikhs living abroad, who don't know the real facts. In every gurudwara abroad you find large posters of him. In fact, all the extremist movements, whether amongst Sikhs, Hindus or Muslims, are funded from Indians living abroad. They have an exaggerated sense of loyalty to this country and it takes an ugly form. Do you see any improvement taking place in the situations in Jammu and Kashmir in the near future? I think Chief Minister Omar Abdullah has been a blessing to the region. He's a forward-looking person who won the elections without being accused of cheating. I think he is the first Muslim prime minister material for India and I rate him very high. I honestly don't take the Syed Shah Geelanis and the others very seriously. They should realise that they only speak for a small section of the Muslims in the Valley. Jammu doesn't support them, as it's largely a Hindu-dominated region. So they do all they can to get his support. The connection with India is all-important. Most of their exports — carpets, shawls, fruit are via the 5-star hotels, all of which have Kashmir emporiums. Kashmiris come in their thousands to find employment. I don't know why they cannot see the connection. Is there anything that you haven't said about politics and politicians before, but can say now? The rise of religious fundamentalism amongst all communities distresses me. I'm an agnostic and therefore I resent it. When referring to the Home Minister Palaniappan Chidambaram, who used the words ‘Saffron terrorism'. Why was that? There's nothing wrong with using it. - Khushwant Singh was born in a tiny village in West Pakistan. Since there was no registration of births and deaths at that time, Singh decided he was a Leo and fixed his date of birth as August 15, 1915. - He studied for nine years at the Modern School and later joined Saint Stephen's College, Delhi before moving to the Government College in Lahore. - He married Kanwal Malik in 1939. She died in 2001. - Arriving in Delhi from Lahore in 1947 after the partition, he abandoned plans to practice law and instead applied for a job in the Ministry of External Affairs. He was appointed Information Officer in the High Commission in London and left immediately for England. - He resigned from his job and started writing. Three of his books were published in quick succession. Next, he worked on a novel on the partition of India and sent it to Grove Press of New York. Meanwhile, he took up a job with All India Radio. -He was employed as deputy head of Unesco's Mass Communication Division in Paris. - His novel Train to Pakistan won the Grove Press award and he quit his job to concentrate on his second novel. - The short stint at the Rock Feller Foundation in London helped him write for the Encyclopaedia Britannica and later he was commissioned to write for the New York Times and the Observer in London. - He took over as the editor of the The Illustrated Weekly of India in Mumbai and held the position for 10 years. - The Indian government honoured him with the Padma Bhushan in 1975. - He became editor of The Hindustan Times and was nominated for the Rajya Sabha. - He began working as a freelance journalist and was employed as consulting editor of Penguin India. - He was awarded the Padma Vibhushan in 2007.